A girl’s transition from childhood to womanhood is always an event to celebrate because this phase leads her to more beautiful world of responsibilities. If you wish to spread word about this transition of your daughter to all those near to you and hold a special celebration in her honor, then its best to employ a custom 4x4 inch Quinceanera announcement square corner magnet. 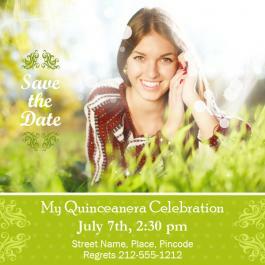 As, Quinceanera celebration is always held on 15th birthday of a girl, which means a personalized 4x 4 inch Quinceanera announcement square corner magnet will remind an onlooker about their expected behavior during the event. It also serves as a great memorabilia of a beautiful family event after the function gets over.